Eliminates double handling! Pull cloth right from the truck to the cutting table. Designed for easy maneuvering in narrow aisles. Supplied with eight sets of bar brackets, four per side (Additional sets available). 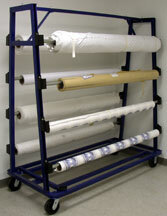 Comes in various sizes that handle 54” to 96” goods.